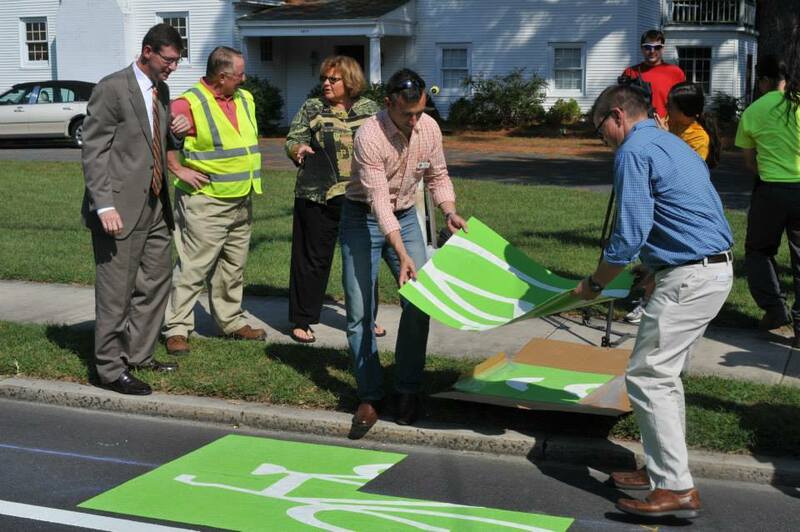 Salisbury residents help install bike lanes and signs to improve bike safety along city roads. The City of Salisbury is building its brand as a healthy place for residents and visitors to live, work, and play. The City’s Gold HEAL Campaign status highlights its commitment to policies and practices that foster a healthy environment where residents have access to nutritious food and places to be physically active. In addition to this award, Salisbury was recently designated a Bronze City by the League of American Bicyclists in recognition of several projects including a downtown river walk, urban greenway, and bike paths to connect parts of the City previously cut off by highway and rail lines. In recent years, the City has invested municipal funding and support in planning and capital projects that increase walkability, bikeability, and healthy food access throughout the City. Salisbury bike infrastructure improvements will be complimented by the launch of a new bike share program, made possible by a partnership with Spin. This spring Spin, a dockless bikeshare company, will place 300 new bikes across downtown Salisbury and Salisbury University's campus. Salisbury's bikeshare program will have unique model. Spin bikes are stationless GPS bikes, however, the City is supporting infrastructure design to build bike stations equipped with racks and signs to help market the bikeshare program and increase its visibility. The city has garnered significant community support as it has moved towards more pedestrian and bike centered transit options and has seen an enthusiastic response from cycling groups and long-time bike lane activists such as Matt Drew, the founder of Bike SBY. Biking advocacy groups, like Bike SBY, are interested in creating an environment that supports an active and safe community for all people and all abilities. In addition to bike infrastructure changes, the City is experimenting with different design models to support pedestrian safety. In an effort to improve safety at major intersections, the City will be implementing scramble crossings that stop all traffic at once, allowing pedestrians to safely cross the street in all directions. Further, Salisbury is working on a creative project to paint sidewalls as murals near youth community centers. “People complain about the speed of traffic, so we’re addressing this through both art and community engagement to ultimately achieve both pedestrian safety and walkability improvements,” commented Mayor Jacob Day, who has been a major proponent and supporter of Salisbury’s HEAL Campaign since the City signed a HEAL resolution in 2014. The City’s HEAL resolution also included new measures to increase food access throughout the community. At the time of the resolution the City had three community gardens; three years later, there are over a dozen community gardens, three of which are located on city owned property. The City is also working on programs to connect the community gardens with youth programs at local community centers. The Camden Community Garden also provides weekday summer lunches through the Summer Lunch at the Garden program. This year the program is hoping to serve fresh, local produce directly sourced from the garden. There has been incredible enthusiasm and community support around the garden programs, notably through the support of Pastor Marten Hutchinson and the Corner Church Collective that oversees and manages some of these garden projects. The City has worked to develop an environment that supports the health and safety of the entire community. The many health-related investments Salisbury has made have resulted in an uptick of young and highly-educated individuals and families moving into the City. “We see that [happening] because we’re providing those assets that people want…It’s about arts, culture, and recreation." Salisbury, Mayor Day reflects, "is a place that allows for a vibrant, active family or individual to be who they are."